Office 365 is a SaaS (Software as a service) by Microsoft. It includes several packages which also includes SharePoint along with One Drive, Excel, Word, Outlook etc. Since this article is very much specific to Apps development on SharePoint on Office 365, hence we will be only discussing about SharePoint (version: 2013). Using App-model feature in SharePoint, We can built SharePoint Apps. SharePoint Hosted apps are hosted on the same server where SharePoint is installed. Whereas Provider hosted Apps are hosted on the different server, can be said hosted on remote server. Here i have explained step by step procedure to setup a development environment on your local machine. I have mentioned two approach for that. Step 1 is common in both the approach. Step 2: Open NAPA Dev tool and create a sample project there. It can be found inside Site Contents of root level Site collection. (Shown below in purple color). If NAPA is not available, you can add it using this URL. Read more about NAPA at the end of this article. Step 3: Click on the “NAPA Office 365 Development Tool". Step 4: Click on “Add a new project”. Step 5: Select “App for SharePoint” and give a name to your app and click on Create. Step 6: In left pane you can find a icon to open the project in Visual Studio on your local system. Click on that icon. Step 7: It will ask to save and run an exe file. Proceed to do that. Step 8: A dialogue box will appear asking permission to run devenv.exe (Visual Studio). Step 9: Dev Environment has been setup. You may delete this app later from Site Contents. 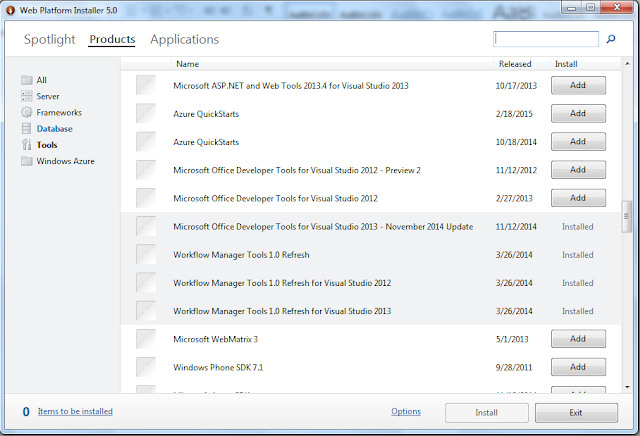 Step 4: Select Microsoft Office Developer Tools for Visual Studio, Workflow manager tools (all four). Finally: Dev Environment has been setup now.